Continued from last week…As it turns out, I didn’t have to wash dishes or spend the night in jail when my debit card was refused at the posh Sir Francis Drake Hotel a couple of weeks ago. For some reason, the card worked at the ATM in the hotel’s basement and spit out the maximum withdrawal of 200 dollars. I scrounged around in my wallet and found enough extra cash to pay my bill. I also found a check. Perfect! 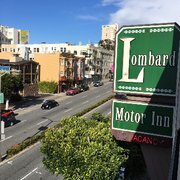 I could use it for my Sunday night stay at the not-so-posh but way cheaper Lombard Inn in another part of San Francisco. No costumed Beefeater, or anyone else, greeted me at the front door of the Lombard. The lobby was tiny. No chandeliers. No grand piano. No bar. No concierge. Only a worn sofa and a frazzled young woman behind the desk who told me I couldn’t check in until her computer re-booted. “No problem,” I said as I sank down onto the worn sofa. The good news was she did have a reservation for me. The bad news was my debit card was refused again. “We don’t take checks,” she said. “Can I call my son and let him give you his credit card number over the phone?” I asked in a somewhat desperate voice. What to do? What to do? The ATM around the corner wouldn’t give me more money because I’d maxed out my withdrawals for 24 hours. I rifled through my purse one more time and, wonder of wonders, came up with enough cash to pay my bill. But just barely. Exhausted and frustrated, I found my room, which didn’t have plush carpet or luxurious beds or six-dollar bottled water. But it did have a coffee maker on the dresser and an ice machine right down the hall and even a complimentary shower cap, none of which were offered at the Sir Francis Drake. I fell asleep early and arose at the crack of dawn to fly back to dear, dear Tennessee. Where my Visa card worked just fine. I learned that my bank puts a hold on debit purchases in California and New York—the two states where fraud is the highest–unless cardholders tell them they’re going to be there. So now I know, just in case I’m ever brave enough to venture back to San Francisco.